Only 8% of Shoppers use Retailer Apps – What Next? 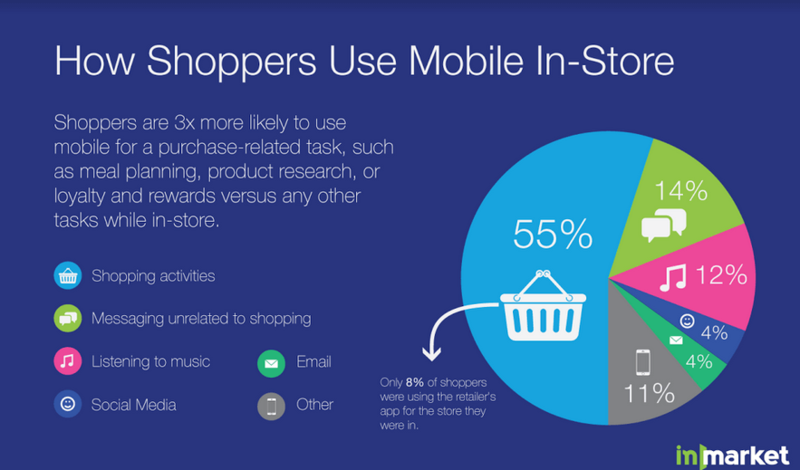 Home » Blog » Only 8% of shoppers use retailer apps – what next? For retailers, mobile apps were the marketing channel that never really took off. A recent study from inMarket found just 8% of shoppers use apps developed by retailers, despite mobile playing a larger role in people’s shopping habits. Meanwhile, users are spending more time in the same old platforms: Google Search, Facebook and the other apps that dominate their lives. So it looks increasingly likely that branded retail apps will play less of a role in the buying journey consumers want to take. Looking back on things now, it’s seems branded mobile apps were always destined to fail. The novelty of downloading applications, signing up for new accounts and wasting precious memory has long worn out. In 2015, Nielsen told us the time spent inside mobile applications shot up by 63% in two years, but the number of apps we’re using is on a serious decline. The average mobile user spends the majority of their time in the same five apps: Google, Facebook and the other usual suspects. There’s not much variation going on there but look how consistent Google Chrome’s position is across each country, except for South Korea. The fact is, when people aren’t using the same old social apps, they’re searching the mobile web. 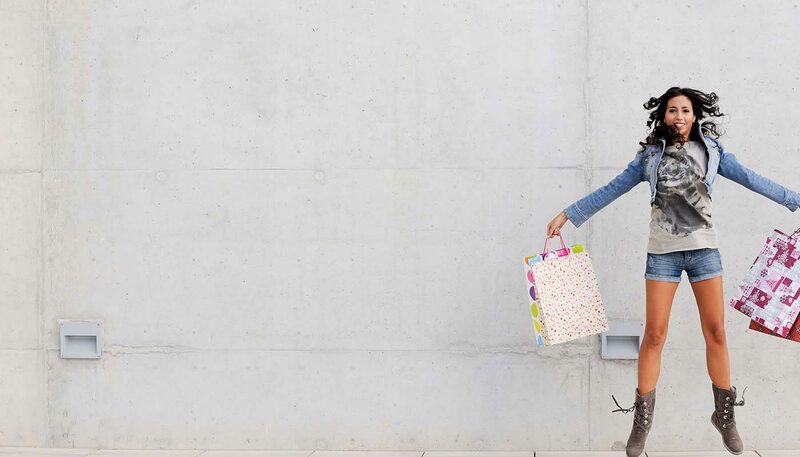 When shoppers get the itch to buy a new product, search engines are the first place they turn. 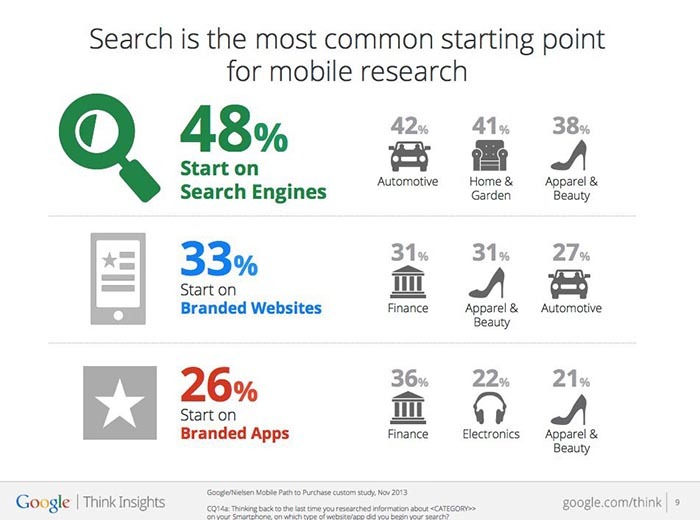 According to Google research, 48% of mobile users start the research process on search engines. What’s particularly interesting about that graphic is it shows how far behind branded mobile apps are. People are more likely to use a brand’s website than download and open their app. The mobile web is changing the way people find products and branded mobile apps don’t have much of a place in the search process they’re taking. When the mobile web first took off, native apps were the only way to bring complex platforms to users. Internet connections sucked and the code used to build websites was primitive by today’s standards. This isn’t the case anymore. We’re now seeing the rise of web applications, where retailers can build app-like websites that operate in the browser, so there’s no need to turn to mobile apps for performance anymore. In fact, building a ‘web application’ makes far more sense when people turn to branded websites before mobile apps. Web apps are also fully indexable – like any other website – but, more importantly, they fit seamlessly into the modern search process users are taking. Unless you can become another Amazon, your place in this process is going to start on Google results pages – whether it’s organic, paid or both. We’re not saying branded mobile apps are a lost cause for every kind of brand, but it’s getting harder to see a future for them in retail. Search habits are moving away from them and mobile technologies are making them more irrelevant every year. So, if you’re in the retail game and tempted by the idea of launching your own branded app, you might want to reconsider. Build your presence on Google, Facebook and the platforms your target audience already spends most of their time on (check out this article Shorten your path to purchase with a chatbot), and then make sure your website offers the best possible experience across multiple devices. This is the journey consumers want to take. Did you miss this retail-related content?